Trumpet was Tom Syson's musical focus from an early age, and Green – his debut sextet release as both composer and player – clearly fanfares a mature artistic vision. Raised in Bedfordshire, Syson's musical education eventually led to him join the National Youth Jazz Orchestra; and his time at Birmingham Conservatoire (taking lead trumpet in its jazz orchestra and graduating with a First in 2015) proved significant in forging associations with some of his fellow students to create the majority of this album's ensemble, including longtime friend and tenor saxophonist Vittorio Mura. So with names who are already becoming pleasingly conspicuous on the UK scene, the line-up is completed by guitarist Ben Lee, pianist David Ferris, double bassist Pete Hutchison and drummer Jonathan Silk, plus a guest appearance by vocalist Lauren Kinsella. Inspired especially by the work of Ambrose Akinmusire and Miles Davis, the trumpeter's sequence of ten originals here (recorded at Real World Studios and produced by Percy Pursglove) is characterful and vibrant, striking a splendid balance between jazz tradition and contemporary influences. It's precisely this intelligently-crafted coalescence which makes it shine so brightly… oh, and the obvious enthusiasm of performances which have fearless improvisation at their heart. There are big, bold statements, such as the thunderous episodes of Constant which are wrapped around the tightly-embouchured solo phrasing of Syson's own improvisations (not unlike those of Nick Malcolm); yet all the while, there's a sense of searching out new ideas rather than simply offering the status quo. So David Ferris' limpid piano atmospheres in, for example, Bamberg and also Far from Boundaries – which prove so effective at different points throughout this recording – lay the foundation for their blithe, unison horn melodies. Wary Warrior's furtive duo of fluttering trumpet over rooted, improvised bass reveals another facet of Syson's imagination, as does the initial, tender melancholy of title track Green, where well-balanced, individual expressions can feel so heart-on-sleeve. Guitarist Ben Lee is already proving to be a great ensemble player on the scene, here adding varied textures to wonderfully drowsy Farewell to Paradise; it's also a great feature for Vittorio Mura's deeply-mined tenor sax improvisations over the slowly-trodden rhythms of bassist Pete Hutchison and drummer Jonathan Silk, both of whom are delightfully fluid across this session. Syson also briefly duels with Silk in agitated, improvised miniature Leroy the Tiger; the sublime openness of Bluebells creates a sunlit environment in which to showcase the whole sextet, featuring the soft bass extemporisations of Pete Hutchison; and POW, a bustling affair full of pacey jazz licks, angular Fender Rhodes stabs and superbly frenzied, scratchy guitar invention from Lee, is an exhilarating curtain call, with trumpet hitting dizzying heights. A final word is saved for the vocal contribution of Lauren Kinsella in tuneful Raindrops. Interpreting Syson's words with unmistakably elegant expression, her already clear, ornamented lines are bookended by idiosyncratic, syllabic deconstruction – and full of endearing babbles, gentle shrieks, humorous yowls and breathy excitedness, it's just an absolute winner. 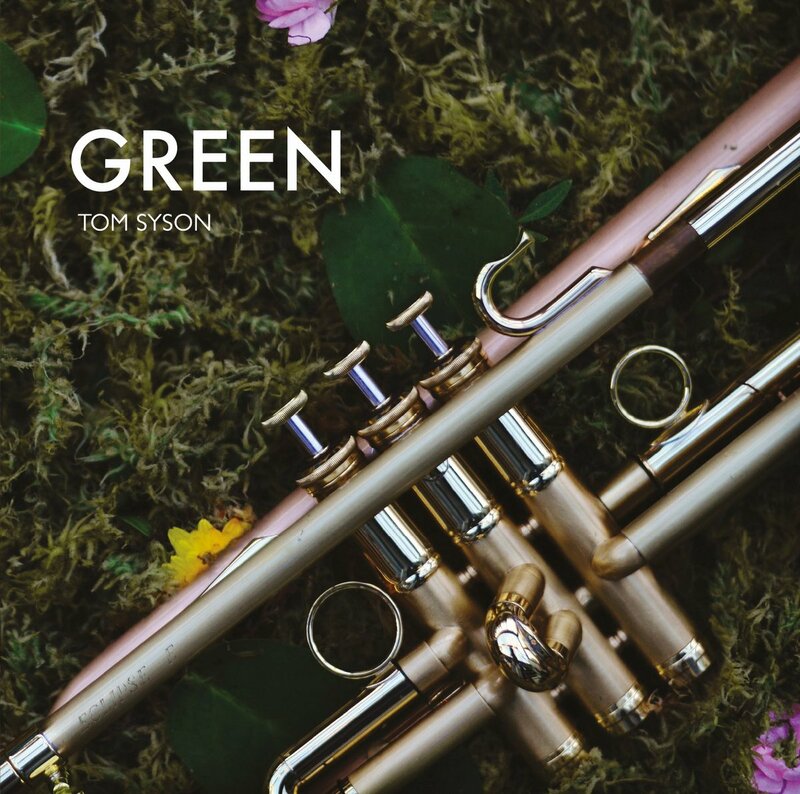 Tom Syson's creativity, as a composer and instrumentalist, leaves one in no doubt as to his bright future in contemporary jazz. He's surely here to stay. Green is released today, 2nd June.